My massage journey actually began thanks to a horse! I have worked in the horse industry since 1998, first as a working student and then professional groom for multiple FEI dressage trainers. 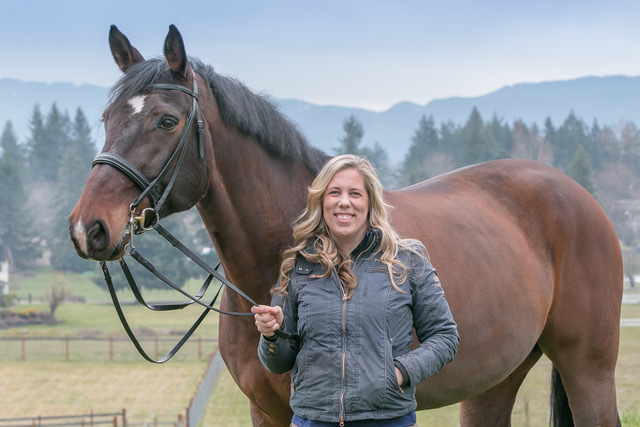 In 2009, I was riding a horse diagnosed with polysaccharide storage myopathy, a genetic muscular disorder, and I enrolled in my first massage course at the Northwest School of Animal Massage in order to learn how to help him be more comfortable in his work. That lit a spark that led to the rest of my massage career. I currently operate a limited equine practice focused on maintaining performance horses in training programs. I specialize in addressing general muscle soreness related to athletic training, pre-competition preparation and post-competition recovery, and managing muscular discomfort related to orthopedic conditions of the back and pelvis. Due to my busy human practice, I can no longer accept equine appointments on short notice. In my experience, massage for horses is most effective as a regularly-scheduled maintenance program rather than a quick fix attempting to address what is likely a lameness issue that requires veterinary attention. I ask clients to commit to a minimum of one session every four weeks. Horses in rigorous training programs or with known orthopedic issues may benefit from more frequent sessions or extra sessions in between competitions. Call me at 253-256-1925 or e-mail me at kyle@kpmassagetherapy.com to discuss a maintenance program for your performance horse or training program. I am available to travel to stables out of area for three or more horses plus a travel fee.